In recent years, the bar has been raised for what constitutes a “healthy” food. This is true both in the dietetics world and the world of the health-conscious consumer. Whereas once people valued food for what it did not have (a high number of calories or fat grams), now many people appreciate what foods do have—vitamins, minerals, and fiber. Not long ago, the health-conscious consumer was satisfied munching on exceedingly dull foods such as rice cakes. But today’s savvy consumer looks for nutrient density, zing, and good taste. Therefore, our list of good-for-you foods, which is by no means exhaustive, highlights foods that taste good, offer outstanding health benefits, and, for the most part, are sustainable choices. Although it takes a balanced diet to ensure good health, three categories stand out for having diverse body benefits: foods rich in omega-3 fatty acids, vitamin D, and calcium. Studies on omega-3s and hypertriglyceridemia also show protective promise. Although many studies have looked at the effects of fish oil supplements and fewer have focused on fish, it appears that omega-3s in either form can help lower triglycerides. In a double-blind, randomized study, participants assigned to a fish oil supplement experienced a 27.8% reduction in serum triglycerides, while those assigned to a high-fish diet saw a 35.5% reduction. In this scenario, as reported in the International Journal of Cardiology, food proved to be the superior source. Scientists believe that omega-3s may also prevent age-related macular degeneration (AMD), since these fatty acids make up part of the retinal nerve cells. One large combined analysis of omega-3 fatty acids and the development of AMD resulted in a 38% risk reduction in those who supplemented with omega-3s vs. those who did not, according to a 2009 article in Progress in Neuro-Psychopharmacology & Biological Psychiatry. Other studies have reported similar results. Although research is inconclusive, many studies suggest that fish is protective against a number of different types of cancer. In the European Prospective Investigation into Cancer and Nutrition, which followed 520,000 people from 10 countries for five years, those who consumed about 3 oz of fish per day had a 30% lower risk of colorectal cancer than those who consumed one third of an ounce per day. Research on whether omega-3s may protect against prostate and kidney cancer is also inconclusive, but early studies suggest some benefit. Nutrigenetic research is playing an increasingly important role in unveiling diet-cancer relationships in terms of omega-3s. Preclinical genetic experimentation has made strides toward determining whether omega-3s can fight breast, colon, and other types of cancer in people of certain genotypes. In one recent study, published in the Archives of Neurology in 2006, mice missing a tumor suppressor gene called Pten were fed either a high or low level of omega-3 fats. Mutations of the Pten gene are found in tumors of the breast, prostate, endometrium, ovary, colon, and other sites. Sixty percent of the mice with the Pten gene survived one full year on a high–omega-3 diet, whereas only 10% of the mice without Pten lived a longer time, and all died before the 10-month mark. This study is the first of many that suggests direct links between omega-3 benefits and heritability and represents the kind of “personalized” nutrition data that will one day be available for advising clients. Many omega-3 researchers note that study findings are often confounded by the difficulty of measuring the actual quantity and quality of omega-3s, the ratio of dietary omega-3 to omega-6 in the diet, and the counteractive effects that other nutrients may pose. And, generally speaking, people who eat fish also tend to eat other healthful foods, making the benefits attributable to omega-3s difficult to tease out. Researchers continue to explore omega-3–rich foods for new whole-body health benefits, with an eye toward the effects these foods may have on different populations. There is abundant experimental research on the role of vitamin D and cancer but little epidemiological research on vitamin D-containing foods and cancer. This is due not only to the limited amount of vitamin D in most foods but also to the difficulty of attributing health benefits to vitamin D, since calcium and other micronutrients often accompany vitamin D in foods. There is limited knowledge about whether supplemental vitamin D has the same effects as naturally occurring vitamin D. A growing body of research, including in vitro, animal, ecologic, and epidemiologic studies, is beginning to connect vitamin D with different types of cancer. Such benefits are, again, likely to result from nutrient synergies rather than from vitamin D alone. Calcium enhances vitamin D absorption, and the partnership of these nutrients in building and protecting bone has been widely researched. The two micronutrients have also been studied for their partnership in fighting cancer. In one double-blind, placebo-controlled trial, vitamin D and calcium together reduced cancer incidence by 75%. But this study was limited by a number of factors. First, the data came from a secondary analysis from a study on bone health; second, no group received vitamin D exclusively.10 Other studies on vitamin D and health have been smaller and have failed to establish a firm vitamin D-cancer link. New nutrigenetic information may help determine which individuals may benefit the most or least from various levels of vitamin D.
Preliminary studies suggest that high vitamin D levels may decrease colon cancer risk. One such study was a prospective, cross-sectional study coauthored by Walter Willett, MD, DrPH, and published in The Journal of the American Medical Association. The study looked at 3,121 mostly male adults older than the age of 50 who underwent a colonoscopy. Those with the highest vitamin D intake had a significantly lower risk of having advanced cancerous lesions than those with the lowest intake. Additionally, the National Health and Nutrition Examination Survey (NHANES) III reported an inverse relationship between colorectal cancer mortality and serum vitamin D status. Blood levels greater than 80 nmol/L were associated with a 72% risk reduction compared with levels below 50 nmol/L. Some small studies have suggested that high vitamin D levels may raise pancreatic cancer risk in some populations, suggesting that body tissues may have varying responses to vitamin D. For example, a 2006 study published in Cancer Research shows that high vitamin D exposure increased pancreatic cancer incidence in Finnish smokers. In this case, cigarette carcinogens may have interacted with vitamin D or other nutrients in the body or they may have acted alone to promote cancer. NHANES III data also suggest that baseline vitamin D status is not related to total cancer mortality. And in the Women’s Health Initiative, in which 36,282 postmenopausal women were assigned to take 400 IU of vitamin D plus 1,000 mg of calcium daily or a placebo, there were no significant differences between the groups in terms of colon cancer incidence over seven years. Additionally, there is ongoing research on vitamin D and the prevention and treatment of type 1 and type 2 diabetes, glucose intolerance, hypertension, multiple sclerosis, lung function, and other conditions. One meta-analysis published in the Archives of Internal Medicine in 2007 showed that the use of vitamin D supplements was associated with a statistically significant 7% reduction in overall mortality from any cause. How does this compare with the benefits from fortified milk, fish, green vegetables, and other foods? More research on vitamin D-rich foods is needed. Currently, the Institute of Medicine recommends 200 IU of vitamin D for women and men under the age of 50, 400 IU for women and men aged 51 to 70, and 600 IU for women and men older than 70. However, recent research indicates that more than one half of postmenopausal women being treated for osteoporosis are vitamin D deficient, a possible signal that recommendations need revamping. As a result, a panel of leading experts called for an increase in current vitamin D intake recommendations to 800 to 1,000 IU per day for women and men over the age of 50 and also recommends individualized treatment for optimal bone health. The National Osteoporosis Foundation recommends that adults under the age of 50 get 400 to 800 IU of vitamin D daily and that adults aged 50 and older get 800 to 1,000 IU of this vitamin. Some people may need greater amounts, some experts say. In the future, these individual levels may be formulated using nutrigenetic information. Many questions on vitamin D and disease are still unanswered. Is vitamin D status more influential on the development of cancer or on the progression of it? At which part of the life cycle is vitamin D status most important: childhood, adolescence, adulthood, or all stages? At what levels of serum vitamin D do individuals run health risks? Does body size, particularly obesity, affect serum vitamin D levels and the vitamin’s ability to act? How can we encourage vitamin D from sunlight without also promoting skin cancer? Much additional research is needed to complete the puzzle of this multifaceted vitamin. Calcium and its many different effects have baffled scientists. One persistent question, for example, is how people in certain cultures (eg, many Asian cultures) can have strong bones and successfully nurse children without much dairy in their diet. This has caused many in the Western world to wonder whether getting calcium from dairy sources and getting high levels of calcium are as important as scientists have traditionally believed. One thing is for sure: Calcium is critical to a number of key body structures and functions. Bones and teeth store 99% of the body’s calcium. The remaining 1% is critical for muscle contraction, blood vessel contraction and expansion, hormone and enzyme secretion, and nervous system signaling. A number of clinical trials have demonstrated that increasing dietary calcium helps lower blood pressure and reduce the risk of hypertension. Yet, again, the exact mechanism behind these possible benefits (whether it is calcium, vitamin D, their relationship, or something else) is not entirely understood. The Dietary Approaches to Stop Hypertension (DASH) study, published in 1997 by the National Heart, Lung, and Blood Institute, is one of the most notable studies on diet and blood pressure. DASH included 450 participants at various sites and assigned them to a control (“typical” American) diet, a diet high in fruits and vegetables, or a combination diet high in fruits and vegetables and low-fat dairy. Scientists believe that it was the abundant calcium in the combination diet that was responsible for the greatest decrease in blood pressure, particularly because dairy calcium is highly absorbable. Again, nutrient-nutrient synergies may have played a role in the effects. After all, the combination diet offered the greatest variety of foods. And based on previous studies, we know that the more variety in the diet, the healthier the person. Some observational and experimental studies suggest that calcium helps prevent colon cancer, although other studies are inconclusive. Data on 135,000 participants in the Nurses’ Health Study and the Physicians’ Health Study were analyzed for diet-disease relationships. This analysis showed that individuals who consumed 700 to 800 mg of calcium per day had a 40% to 50% lower risk of developing left-side colon cancer than those who consumed lower amounts of calcium. However, in terms of the calcium-colon cancer relationship, there are many factors at work. Among these are genes, gender, race, and ethnicity. A study by Dai et al published in the American Journal of Clinical Nutrition in 2007 reported on the influence of the body’s calcium-to-magnesium ratio and genotype and their combined effects on colon cancer. Individuals with a particular genotype (AA) who also had the highest calcium-to-magnesium ratio had the highest odds ratio for colon cancer. Similarly, Wong et al reported in Carcinogenesis in 2003 that calcium levels and genes affect colon cancer risk. Those with the ff genotype who consumed the highest levels of calcium had the highest odds ratio for colon cancer. This type of nutrigenetic information changes the black-and-white notion of high calcium levels as carcinogenic or noncarcinogenic into a more complex, multifactorial diet-disease picture. In terms of breast cancer, it appears that calcium- and vitamin D-rich foods may offer a modest protective effect, but calcium and vitamin D do not appear to protect against ovarian cancer. These findings reflect data from two studies, one by Cui and Rohan and the other by Genkinger et al, both published in Cancer Epidemiology, Biomarkers & Prevention in 2006. Recently, calcium has received press for its potential to support weight loss. According to critics, the media buzz largely inflated the results of two small randomized clinical trials, one by Summerbell et al published in 1998 in BMJ and another by Zemel et al published in 2004 in Obesity Research. Both studies reported a significant negative relationship between dairy intake and body weight. Less widely reported were these studies’ numerous limitations. To start, both studies involved just over 30 subjects. Second, it is unclear whether the test diets were eucaloric. Furthermore, with many dietary factors at work on appetite, such as satiety, exercise levels, and hours of rest, the chances that the weight loss was attributable to calcium or dairy intake alone may be lower than the media reports suggested. However, if calcium is linked to weight loss, it would generate whole-body benefits with this effect alone. Dairy foods appear to lower the risk of insulin resistance syndrome, and weight loss also lowers insulin resistance. One cross-sectional analysis of men and women aged 30 to 60 published by Mennen et al in Obesity Research in 2000 demonstrated that intakes greater than one serving of calcium-rich food per day can decrease the risk of insulin resistance syndrome in men only by 40%. Since overweight and obesity, as well as insulin resistance, have been directly linked to heart disease, diabetes, cancer, and other conditions, dairy foods may confer whole-body benefits by keeping body weight in check. While recent health reports have highlighted fish, dairy, greens, and other foods rich in omega-3 fatty acids, vitamin D, and calcium, there are many other foods that contain nutrients and nutrient combinations that are of great interest to scientists for their diverse health benefits. It’s important to read current research to learn about not only the connections between nutrients and disease but also between foods and disease. After all, it’s food that we eat and it’s food that we talk about when counseling clients. It is also increasingly important to understand emerging genetic information that may make certain foods and nutrients more beneficial to certain individuals than to others. One day, we may be working with genetic maps, helping clients choose the foods that are most beneficial to them. A number of additional foods and nutrients are under study for their whole-body benefits. Watch for research on a number of phytonutrients, including flavonoids, soy isoflavones, and resveratrol, as scientists continue to uncover the effects of these highly promising, yet poorly understood, food components. While nutrigenetic and epidemiological research continues to unfold, dietitians can encourage their clients to focus on eating a variety of whole foods—still the key to getting the greatest health benefits and greatest pleasure from food. It’s the grand total of all the foods that we eat, and not just a handful of their individual nutrients, that helps preserve good health and prolong and enhance human life. — Christen C. Cooper, MS, RD, is a Pleasantville, N.Y.-based freelance health and nutrition writer. She has worked in healthcare consulting in Latin America and the United States and holds a master’s degree in nutrition education from Teachers College, Columbia University. • Although supplements are in vogue, recent research shows that the body absorbs omega-3s far more efficiently from seafood than from capsules. • Scientists are unsure about the mechanism, but early studies suggest that wine may help maximize the health benefits of omega-3s. • For those concerned about polychlorinated biphenyl content, discard the fish skin and trim off belly and back fat before preparing to reduce the amount by up to 40%. • Eat a variety of sources of dietary calcium. While dairy calcium is more efficiently absorbed, there are many other benefits to eating green vegetables such as spinach, broccoli, and bok choy, which are calcium rich. • Researchers have studied supplements, which appear to be beneficial, but the calcium in foods seems to benefit those living in cultures with plant-based diets. Since very high calcium levels may contribute to the development of some cancers, food sources are good choices because they contain modest amounts. • Some foods contain nutrients that bind calcium and prevent its absorption, but eating a balanced diet makes this less of a concern for healthy individuals. 1. Gebauer SK, Psota TL, Harris WS, Kris-Etherton PM. N-3 fatty acid dietary recommendations and food sources to achieve essentiality and cardiovascular benefits. Am J Clin Nutr. 2006;83(6 suppl):1526S-1535S. 2. Kris-Etherton PM, Harris WS, Appel LJ. Fish consumption, fish oil, omega-3 fatty acids, and cardiovascular disease. Circulation. 2002;106;2747-2757. 3. Kris-Etherton PM, Innis S, American Dietetic Association, Dietitians of Canada. 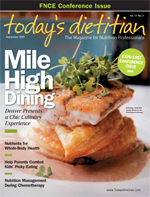 Position of the American Dietetic Association and Dietitians of Canada: Dietary fatty acids. J Am Diet Assoc. 2007;107(9):1599-1611. 4. Bucher HC, Hengstler P, Schindler C, Meier G. N-3 polyunsaturated fatty acids in coronary heart disease: A meta-analysis of randomized controlled trials. Am J Med. 2002;112(4):298-304. 6. Crowe FL, Skeaff CM, Green TJ, Gray AR. Serum phospholipid n 3 long-chain polyunsaturated fatty acids and physical and mental health in a population-based survey of New Zealand adolescents and adults. Am J Clin Nutr. 2007;86(5):1278-1285. 7. Barberger-Gateau P, Raffaitin C, Letenneur L, et al. Dietary patterns and risk of dementia: The Three-City cohort study. Neurology. 2007;69(20):1921-1930. 8. Chong EW-T, Kreis AJ, Wong TY, Simpson JA, Guymer RH. Dietary omega-3 fatty acid and fish intake in the primary prevention of age-related macular degeneration: A systematic review and meta-analysis. Arch Ophthalmol. 2008;126(6):826-833. 9. Davis CD. Vitamin D and cancer: Current dilemmas and future research needs. Am J Clin Nutr. 2008;88(2):565S-569S. 10. Lappe JM, Travers-Gustafson DT, Davies KM, Recker RR, Heaney RP. Vitamin D and calcium supplementation reduces cancer risk: Results of a randomized trial. Am J Clin Nutr. 2007;85(6):1586-1591.